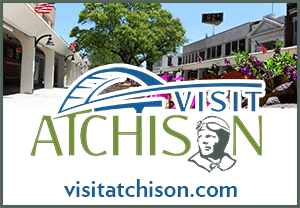 In 2013, the Atchison Area Chamber of Commerce sold over $142,000 worth of gift certificates that were redeemed at participating chamber businesses in Atchison! There is no additional charge to participate in this program, and all you need to do to participate is be a chamber member in good standing. And unlike similar gift card/certificate programs, there is no additional processing fee to be paid by those purchasing the gift certificates, making it an ideal gift choice. Purchasing a Chamber Gift Certificate ensures that money is spent locally at over 100 member businesses and helps build the area economy. This is also an opportunity to give the recipient the ability to purchase exactly what they want or need! View the list of participating businesses at the bottom of this page! They get their choice of where they spend their “Chamber Cash” at over 100 local businesses, ranging from retail, dining, and personal care to utilities! The Atchison Area Chamber of Commerce guarantees that participating merchants will always treat a gift certificate as a cash transaction. Each Chamber Gift Certificate will come with a blank “Pay To Order Of” line. This line is for the merchant name that redeems the gift certificate. At the bottom left corner of the gift certificate is a To: and From: line that can be used to write the recipient’s name. Gift certificates are accepted at Chamber member businesses either listed on the website Chamber Gift Certificates page or included on the print-out provided with the certficate. 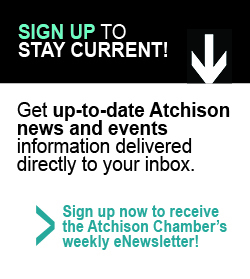 Check the Chamber website (www.atchisonkansas.net) for the most up-to-date list. Call (913) 367-2427 or (800) 234-1854 to place your order. Please allow time to process large orders accordingly. All orders must be picked up Atchison Area Chamber of Commerce office between 8:00 am and 5:00 pm. The Chamber offices will be closed on Dec. 24th through Dec. 27th. If you need to purchase gift certificates for Christmas, please do so by Dec. 23rd at the latest.